The Galesburg Weekly Mail of October 12, 1899, carried a variety of news about happenings in Galesburg. The library board had held its regular monthly meeting and received the resignation of the librarian, Miss Celia Hayward. She had been with the library for about one and a half years. A committee of board member would look to finding a new librarian. The board also approved buying more than one copy of popular books. Having only one copy caused delays for interested readers. A single copy of a book also wore out more quickly. The reading room was to be open for 2 to 6 pm on Sunday afternoon because of patron’s requests. No books could be checked during that time. An article copied from the Sterling Standard reported on progress of the work being done for the Hennepin Canal. Several construction companies were working on different sections of the waterway and confronting digging problems as well as financial ones. Complaints had been made about the “Q” flagmen in Galesburg using a white lantern at crossings instead of a red one to warn travelers that a train was approaching. The flagmen responded that the rules of the company required a red light should be used for danger signals for trains only. The flagmen contended that if a red light was used to stop travelers, the trains would stop as well. The flagmen responded they always went out on the crossing in plenty of time for a warning and that they always gave the proper signals to travelers. John Fickle of Monmouth had a fickle horse which became weary of watching the street fair and wandered away from his owner. Mr. Fickle thought the horse had been stolen, but it was found on North Henderson Street later. Three valiant policemen found a disorderly horse on the street Sunday and arrested it by their combined efforts. They took the horse to Hanson’s barn and left it. As soon as they had gone the horse died. It is not known whether death was caused by the fright suffered from the onslaught by the bold officers, the prospect of food, too much street fair or the restraint of captivity. The Auditorium was advertising two amusements: “The Musketeers” and “Uncle Tom’s Cabin.” Paul Gilmore was appearing in “The Musketeers”. He was a popular actor in the late nineteenth and early twentieth centuries. He also appeared in a number of silent movies. In 1948 he and his daughter established a comedy theater in Duluth, Minnesota. He died in 1962 and is buried in Key West, Iowa. 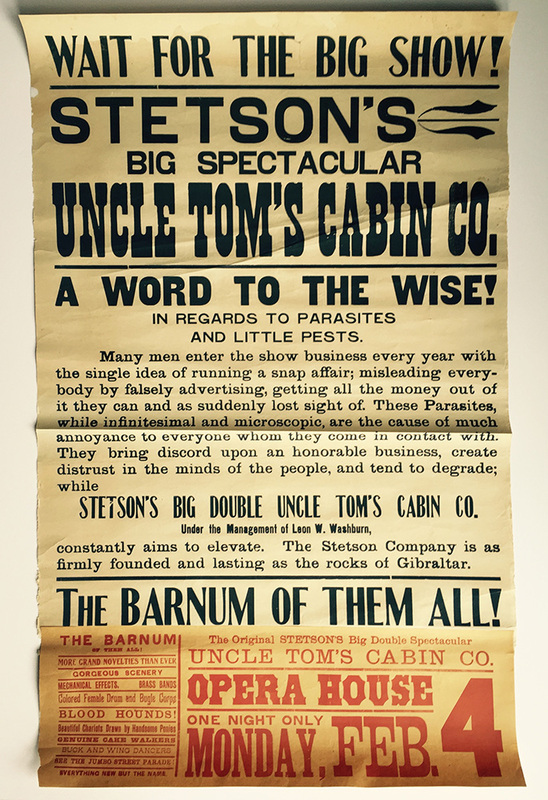 The Stetson Company version of “Uncle Tom’s Cabin” was also coming to the theater. Ticket prices were 10, 20, 30 and 50 cents each. The most expensive seat would be $14.94 in today’s money. We don’t know what Carl Sandburg did that day. He more than likely read the articles just described as he was an avid newspaper reader.